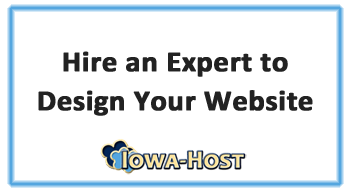 A mobile-friendly website by Iowa-Host will get your business up and running quickly and affordably. We don't sell you "extras" that you don't need. Today, more people are using mobile phones and tablets instead of laptops and personal computers so be sure that your website is a mobile-friendly website that works properly on all of the devices to ensure that everyone can access your website. Over the last few years, Google has been changing the way it shows its search results and has been stressing that mobile-friendly websites are the wave of the future. This change has been coming mainly due to the increase of people viewing websites on mobile phones as opposed to viewing websites on traditional desktop computers. Now, the time is here, Google began to demote websites (for mobile phone searches) if your website is not mobile-friendly. While this, currently, does not affect searches that are done on desktop computers, you may still want to take note and ensure that your website is mobile-friendly since roughly half of all searches are now done on mobile phones. If your website design is not mobile-friendly, you could find yourself without as much website traffic (and business income) from the online world. Want to know if your website is mobile-friendly? It’s easy to find out … Just go to Google’s Mobile-Friendly Website Test and enter your website address.